my favourite food is on the right! My husband swears mine is salmon and I think I’d have to agree. You see I could eat salmon for breakfast (gross, I know), lunch and dinner and be quite very happy! mmm! what a delicious looking meal (apart from the skin getting stuck in the pan! )….get in my belly! My husband says his favourite food is carrots (although I swear it really is chocolate). Why is this of interest I hear you ask? Well what better (other) way to make a man happy than through his tummy, right? And girls, we all know it’s not ‘happy wife, happy life’- it’s definitely the other way around! So I was trying to think of an interesting dish I could make out of carrots for last Saturday night’s dinner party. 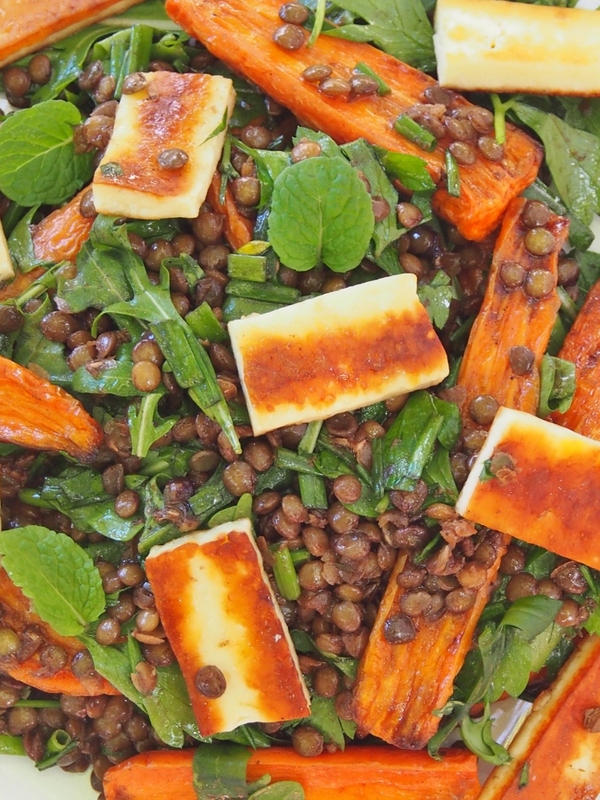 This is a great dish for anyone who have never cooked lentils before. 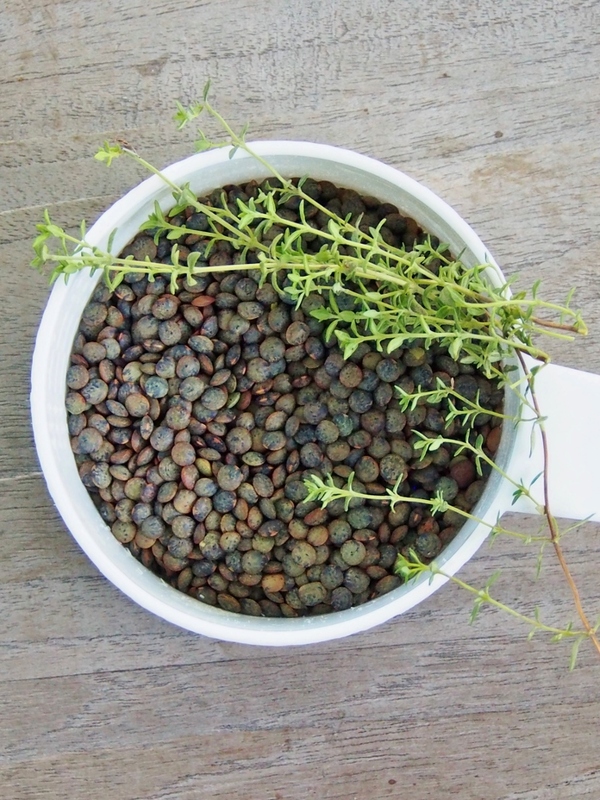 Lentils are so easy to use as they don’t require you to pre-soak them. Plus these ones only take 15-20 minutes to cook. Actually grown in Australia, these French green lentils (also known as du Puy or le Puy lentils, but you are only allowed to use that name if they are grown in France) are my favourite lentil to use in salads as they hold their shape and look great! 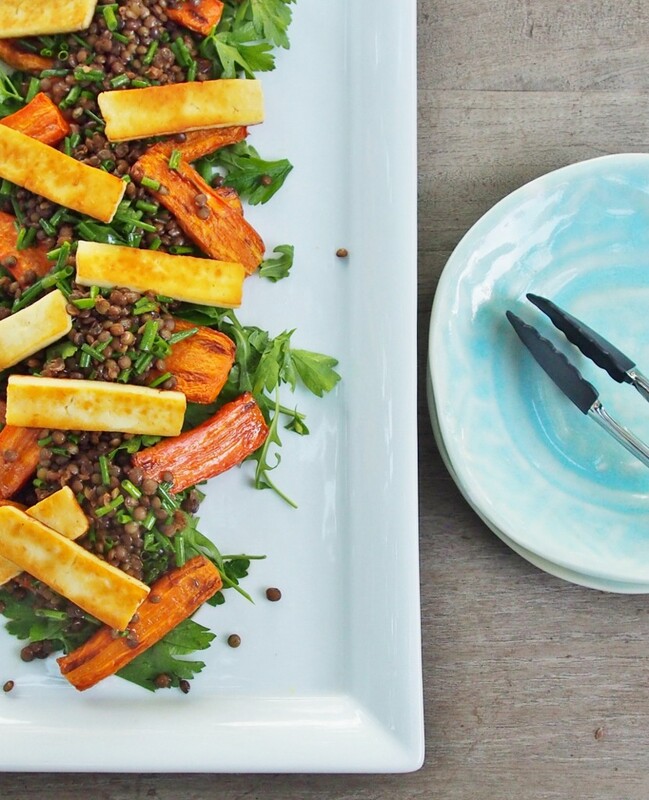 Go on, give this salad a go. Especially if you have never cooked lentils before as you will see how quick, easy and delicious they can be! Heat oven to 200 degrees C and line a baking tray with greaseproof paper. Wash carrots. If long (more than 10 cm), cut in half first, then cut in half lengthways. Place in a medium sized bowl, drizzle over some olive oil and sprinkle with a pinch of salt. Toss to coat. Tip onto baking tray and bake for 30-40 minutes, or until golden brown. You may like to turn them over halfway through so they brown evenly. Meanwhile, boil the kettle, then place lentils in a medium saucepan, along with about 3 cups of boiling water and heat until the water comes back to the boil. Reduce heat and simmer, partly covered with a lid, for about 20 minutes, checking after about 15 minutes. You want your lentils to be slightly firm, definitely not mushy! When cooked, drain and rinse and return to saucepan. Add remaining olive oil, along with the balsamic vinegar, pomegranate molasses, honey, chives and a pinch of salt. Stir to coat the lentils and if using immediately, place lid on pot to keep warm. When ready to serve, heat a frypan over medium heat. When hot, add slices of haloumi and cook until golden brown on both sides. Scatter herbs over the base of a serving platter. 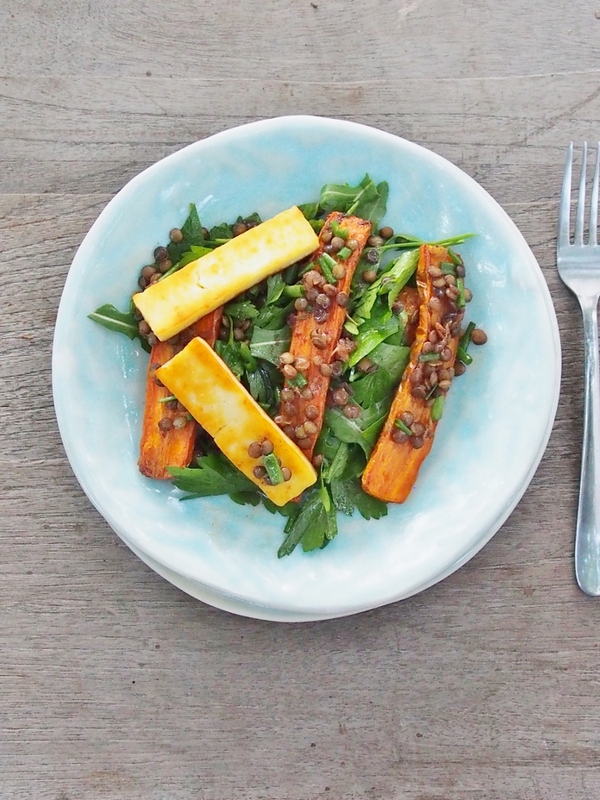 Top with carrots, then lentils and drizzle evenly with remaining dressing. Lastly top evenly with cooked haloumi and serve. 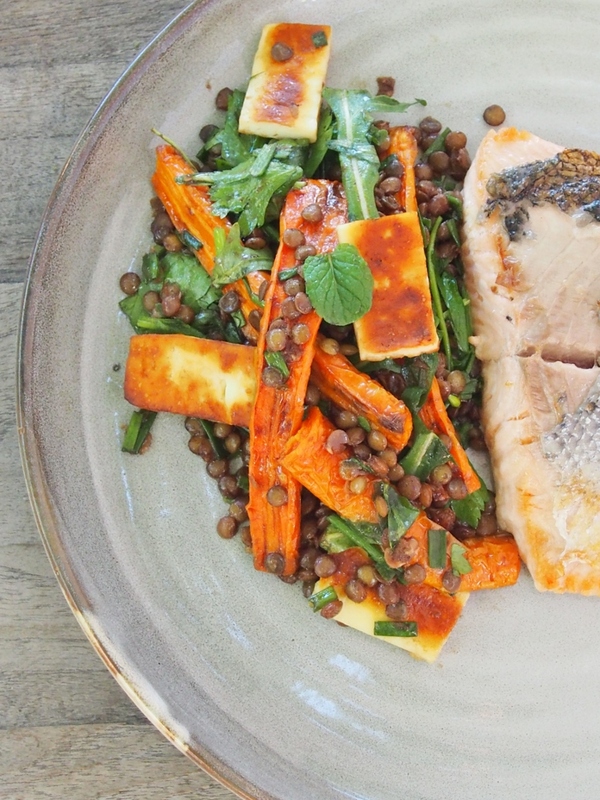 Both the carrots and lentils can be cooked earlier in the day, or even the day before. 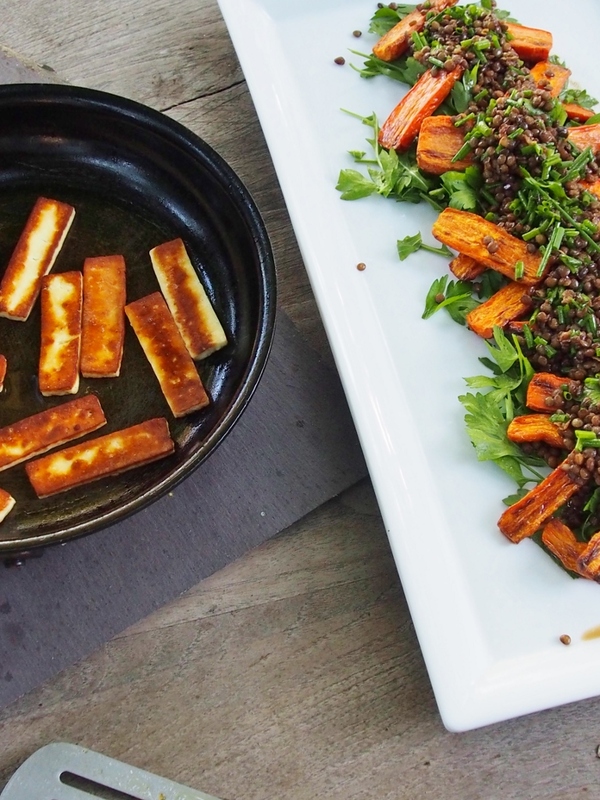 When ready to serve the salad, reheat carrots in a moderate temperature oven and gently reheat lentils on the stove for a few minutes, until just warm. Why are carrots so healthy for me? They are most famous for being full of the antioxidant beta-carotene, which actually gives them their bright orange colour. Beta-carotene is the pre-cursor to Vitamin A, which is also a very important antioxidant, but can be toxic if consumed in the form of Vitamin A (most noted cases are from people eating too much animal liver). Instead, if we eat foods containing beta-carotene our body converts it to Vitamin A as we need it. Pretty cool huh! Vitamin A helps maintain normal reproduction, vision and immune function (so important as we come into Winter to help fight colds and flus). 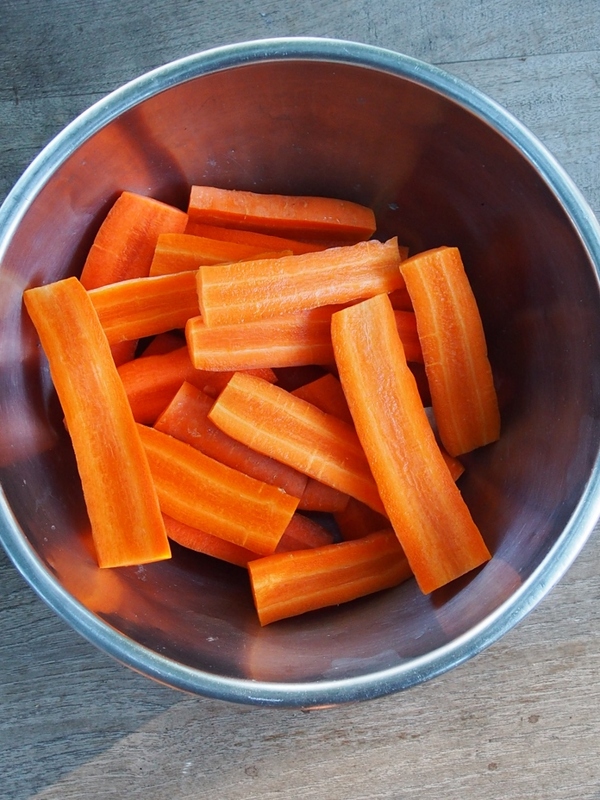 Vitamin A promotes good vision, especially in low light, thus the saying ‘eat your carrots so you can see in the dark’! 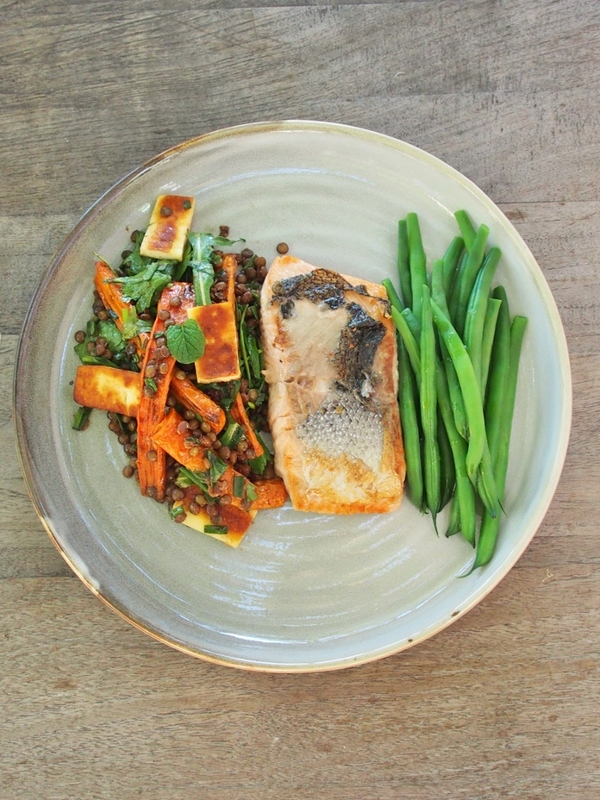 Click here to learn more about lentils and why you should be eating them often! Or you can come to my Veggie-licious cooking class to find out more too!